European-style hotel with ocean view! Herren-haus Hotel, situated by Anmok beach, was built with a medieval European mansion in mind. True to its name 'Herren-haus', which means house of nobility in German, all rooms have panoramic views of the East Sea for guests to admire. The 26 rooms of our hotel are categorized in 7 colors (white, pink, ivory, red, blue, purple and green) and the designer of the hotel made sure the place holds a classic and romantic ambience. 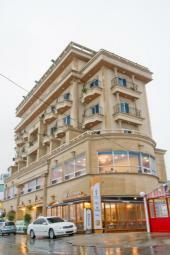 There are numerous tourist attractions nearby for our guests to enjoy - Gyeongpodae, the world's one and only Chamsori Gramophone Museum, Jungdongjin, the vast whites sands and shallow waters of Jumunjin beach, the Daekwan Hill joining the Yeongdong and Yeongseo region, Anmok Port, and much more.